The Futura SLIDE Display System has the same signature look as our standard Futura line only easier to insert and change graphics. The Futura SLIDE system is designed with an acrylic sleeve to slide your graphics in and out of in a matter of seconds. *All print related products come standard with a design & layout consultation from a member of Aluma’s experienced design team. The following optional file upload box will appear at the end of checkout. Please upload all files required to fulfill your order & your designated Aluma design team member will contact you afterward to verify your print quantities & configurations. 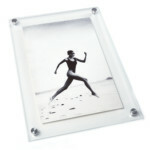 *For certain print products, slight cropping may be required to fit the chosen frame or print media proportions. After checkout, the design team will verify with you that the quality of your print will allow for the greatest result. *All discounts are automatically calculated in your shopping cart. Promotional codes may not be combined with volume discounts. Mix and match different size products within a product line to receive great volume discounts. *XL Orders will be shipped by ground freight. *Contact Aluma for a quote for urgent rush jobs or if you require additional services such as Inside Delivery or White Glove Service. The Futura SLIDE is a beautiful high-end modern brushed metal display system that is great for displaying mission statements, retail POPs and any other graphics which need to be changed quickly without removing the display from the wall. The unique three layer design creates a pocket that allows you to easily slide your graphics in and out of the Futura SLIDE display system. No need to sacrifice form for function, our modern Futura SLIDE displays are hand-crafted in the USA using high quality acrylic, brushed metal, and modern architectural hardware. 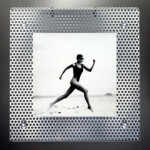 The Futura Slide also features a beautiful brushed metal facade to frame the image. 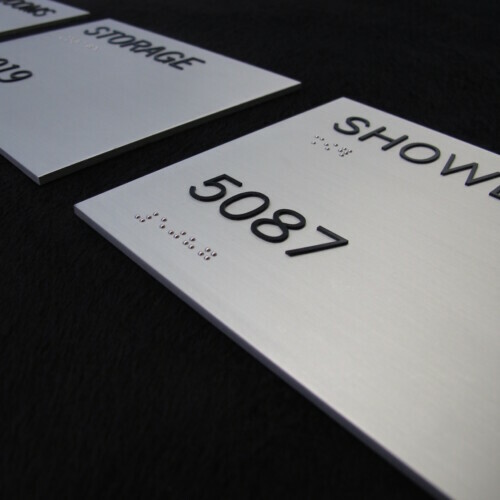 Attention to detail is what sets Aluma’s display and signage products apart from the rest. 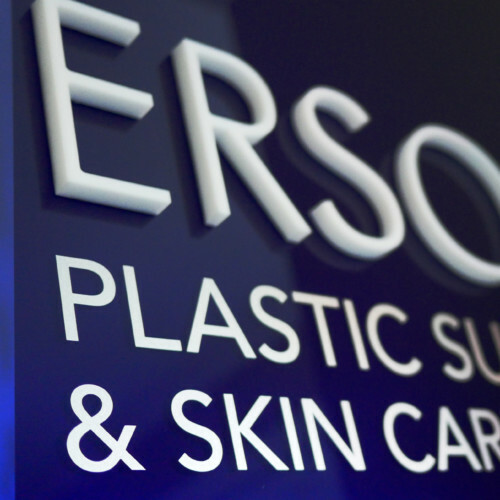 We strive to create the most beautifully finished signage and display solutions for all your modern display needs. 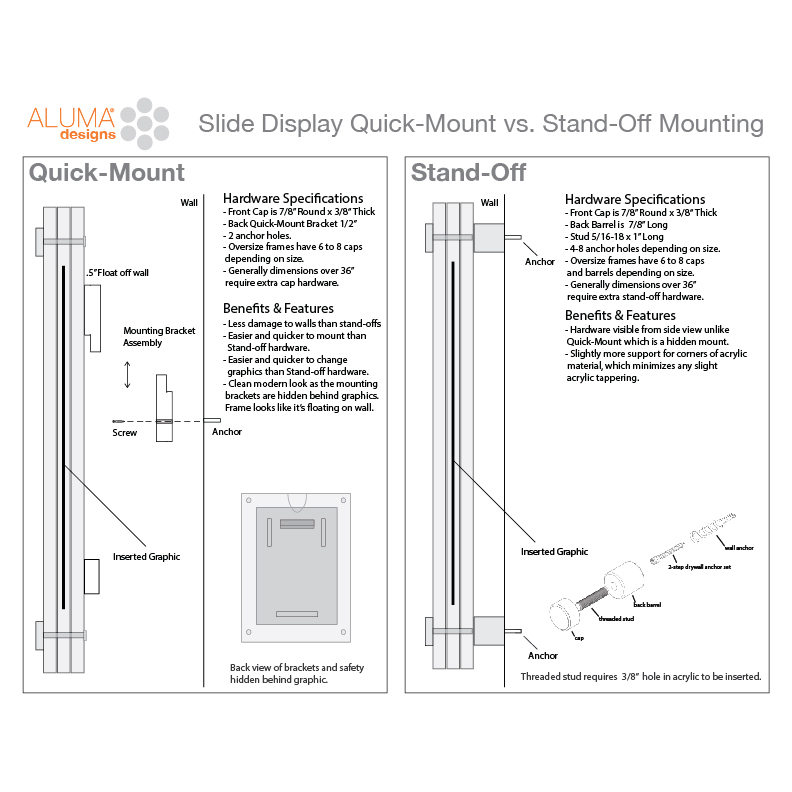 All Futura SLIDE displays come with everything needed to mount to most surfaces. Standard sizes are available from 12.5″ x 15″ to 28″ x 40″ (Contact Aluma for all your Custom needs). Some standard sizes are nominal due to yield of materials (i.e. 24″x36″ will result in an Actual Size of 23.75″x35.75″). Larger displays also feature additional hardware. These variations are listed in the product attributes and/or images above. *Custom products will be exact to customer specifications. 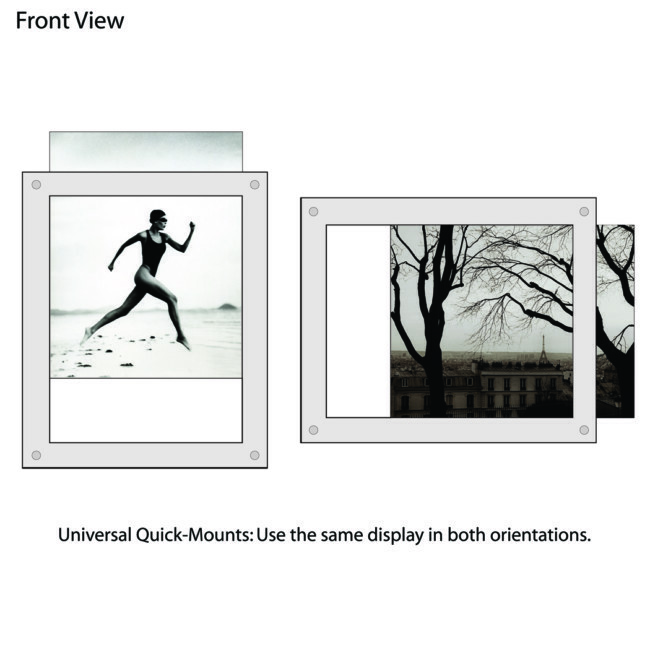 Our Futura SLIDE Displays utilize quality 1/4″ acrylic fronts & backs around the image. Smaller SLIDE products may have a third 1/8″ U-Channel layer between the front and back layers for the graphics to slide into. Large Slide Displays have a 1/4″ U-Channel that allows for thicker items to be inserted in the display unit. 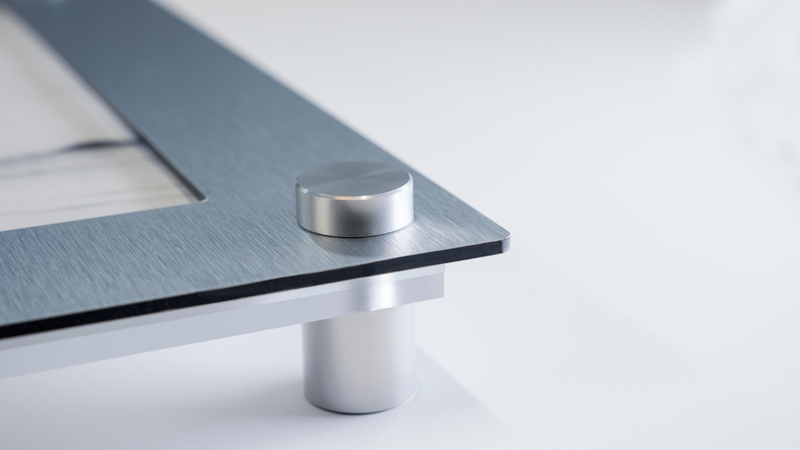 All Futura SLIDE products come standard with beautiful satin finished edges (Platinum hand polished edges available as an upgrade). Our Futura SLIDE Displays utilize quality 1/8″ brushed metal frame. *Both the Quick Mount and the Stand-Off version of our Futura SLIDE are modern and minimalist. The Quick-Mount version is very minimalist and looks as if the display is just floating on the wall. Less damage to walls and ease of hanging make the Quick-Mount version a top choice of commercial clients nationwide. The Stand-Off version is a great value for those projects on a tighter budget who do not want to compromise quality. All hardware needed to mount booth the Quick-Mount and Stand-Off version is included. The 5/8″ hardware is more proportionally suited to smaller frames while the 7/8″ size works well with larger frames. 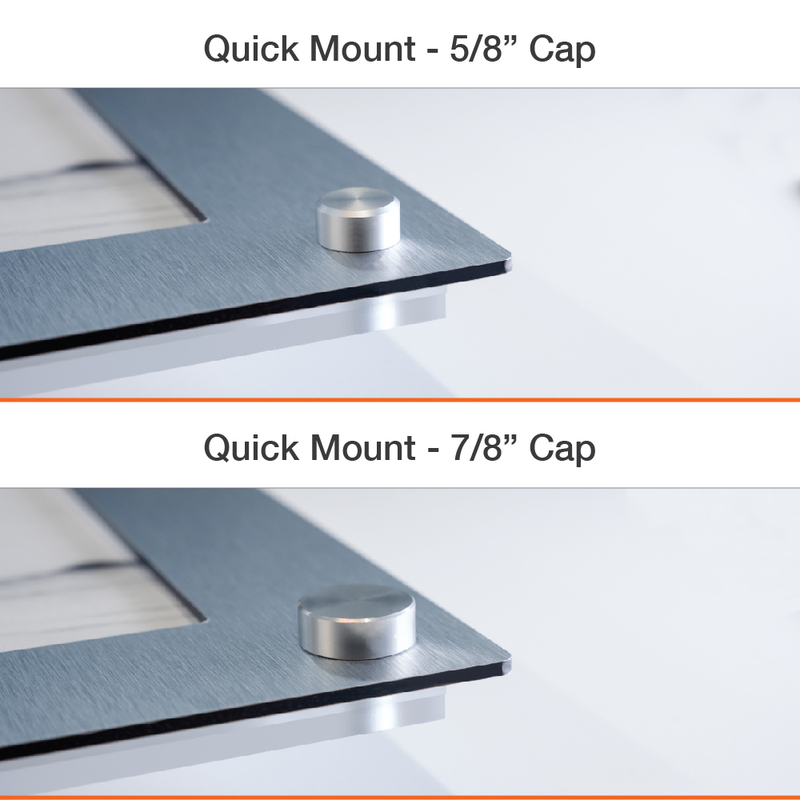 The included brushed metal back barrels mount your Vetro SLIDE display 7/8″ off of the wall (See the cap guide in product images to determine how many sets of stand-off hardware your selected size has). A Unique clear acrylic french cleat system is used to float the frame off the wall by a 1/2”. Easy to hang, no hardware design and minimal damage to the walls are a few of the benefits of our quick-mount system. 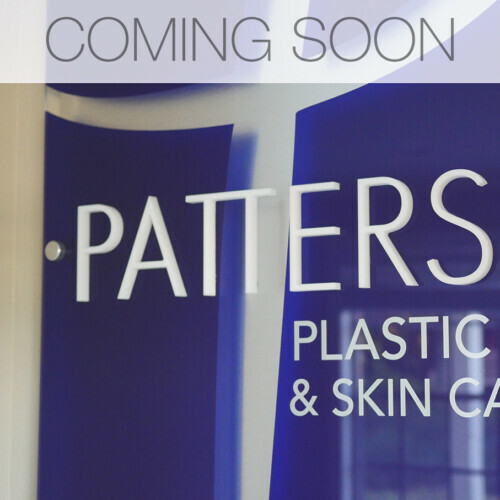 All SLIDE displays come standard with Satin Finished edges and may be upgraded to our Platinum polished Edge. Satin Edge: Super Smooth Frosted Acrylic Edge (No tool marks). Platinum Hand Polished Edge: Hand Sanded and polished to give the edges a crystal clear appearance. Aluma uses the latest digital technologies to provide you with the highest quality custom digital prints. **If you select a printing option, one of our printing professionals will contact you for the high-resolution document to be printed. Epson Premium Semimatte Photo Paper (260) – (10.7 Mil) Epson Premium Semimatte Photo Paper offers professional photographers and graphic artists an additional option in resin coated photographic paper. Highly saturated, high resolution images can now be displayed on an elegant, understated semimatte finish that minimizes glare, while maximizing presentation quality. Its 10 mil thickness and extremely wide color gamut will make this paper a favorite among discerning professionals, while its instant drying and non-cockling characteristics make use, handling, and display of finished output trouble-free. It creates highly saturated prints by offering maximum ink coverage and a high D-Max for true photograph productions. Epson Premium Photo Luster 260 – Wedding, portrait and fine-art photographers have traditionally used luster paper for their photos. Now Epson offers new Premium Luster Photo Paper (260), the upgraded version of its popular Premium Luster Photo Paper (250), to digital printmakers. Premium Luster Photo Paper (260) delivers highly saturated prints by offering maximum ink coverage and a high D-Max for true photographic reproductions. Its 10-mil RC base gives prints a photographic feel, and keeps the paper cockle-free. Ideal for use with all Epson Inks. Like all of Epson’s innovative media, this paper is engineered to give you the highest resolution and color saturation possible. As always, Epson supplies guarantees Epson quality. Fredrix Satin Canvas – Designed to boost the output quality of printers using solvent, low-solvent, latex and UV-curable inks, Sunset by Fredrix Satin Canvas SUV provides a high-quality, acid-free and pH neutral base for consistent production printing. The bright-white poly-cotton canvas with a traditional two-over-one weave is ideal for décor, fine-art and photo reproduction applications. Hahnemuhle German Etching 310gsm – (0.50mm) Fine Art Giclee’ Prints using Epson Ultrachrome K3 archival inks. – 91.5 whiteness – 99.0 opacity – with optical brighteners – Natural White, mould-made, 100% chlorine free pulp. The heavy-weight etching board Hahnemuhle German Etching Paper has a matte, velvety surface and the attractive warm white shade of a traditional artist’s board. German Etching is a genuine mould-made paper is ideal for sophisticated original prints. This archive grade paper is one of the most popular media in use worldwide for art reproductions. *Contact Aluma for pricing on special rag edge finishing. What is the production time for Futura Slide Displays? The turnaround time for this product is 3-5 business days. Higher bulk orders may vary. 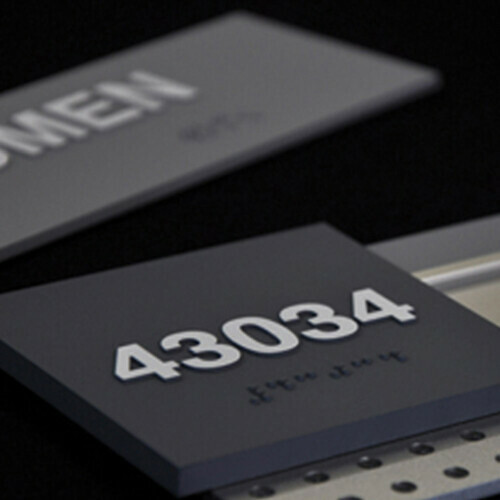 What sizes are available in the Futura Slide Display? Standard sizes are listed in the Size attribute above. Why are some sizes different from what is listed in the product attribute? Some standard sizes are nominal due to yield of materials (i.e. 24″x36″ will result in 23.75″x35.75″). Larger displays also feature additional hardware. These variations are listed in the product attributes and/or images above. *Custom products will be exact to customer specifications. Should I order a Quick-Mount or a Traditional Stand-Off version? Both Versions of our Futura frame use the same high quality architectural stand-off hardware and look the same from the front view, they are just attached to the wall differently. 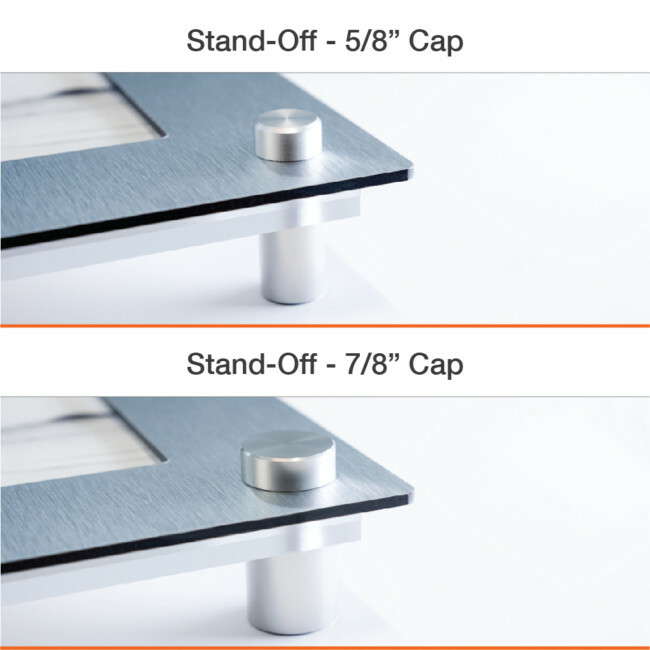 The Futura Quick-Mount version has the look of a standoff system but allows for easier mounting and media changes due to the unique hanging bracket that allows for the frame to be quickly mounted and removed from the wall. The Traditional Stand-Off version is slightly harder to hang and is not quite as easy to change images but is a great option when the items you need to frame are transparent or of a unique size which would make hiding the rear mounting bracket of the Quick-Mount version impossible or difficult. Yes, for large commercial projects, Contact us and we will prepare a discounted quote for you with your respective volume discount applied. Does all the mounting hardware come with my Futura SLIDE display? Yes, every display comes with all the necessary architectural mounting hardware to hang your Futura SLIDE display. Can I mount and hang The Futura SLIDE myself? Yes, Every frame comes with easy to understand directions and can be hung with just a few simple tools. 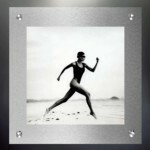 You can download our framing and hanging directions directly from the Futura Slide product page. 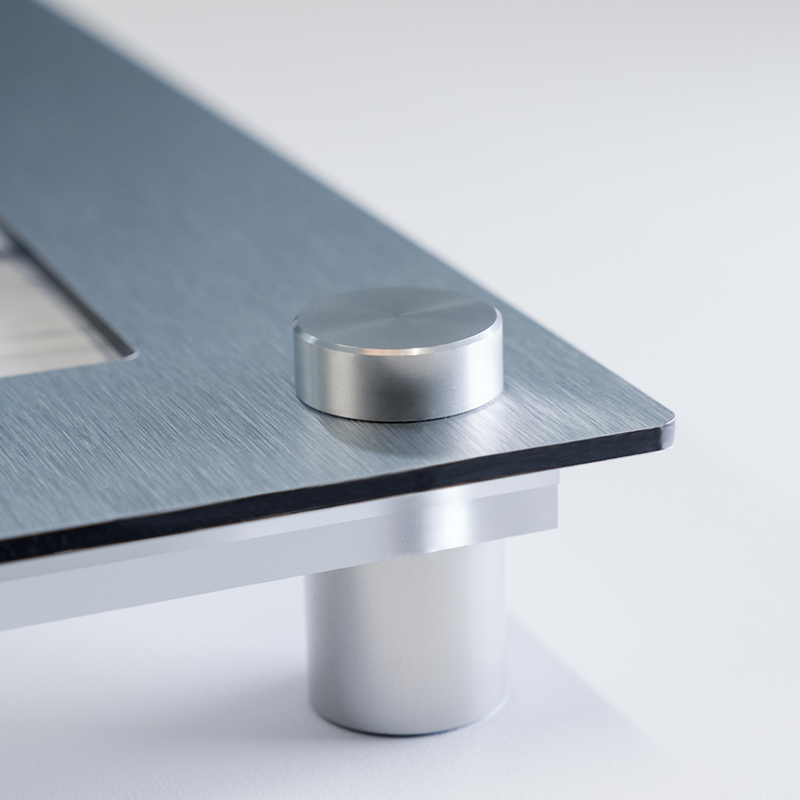 What thickness of acrylic and brushed metal do you use in the Futura SLIDE display? 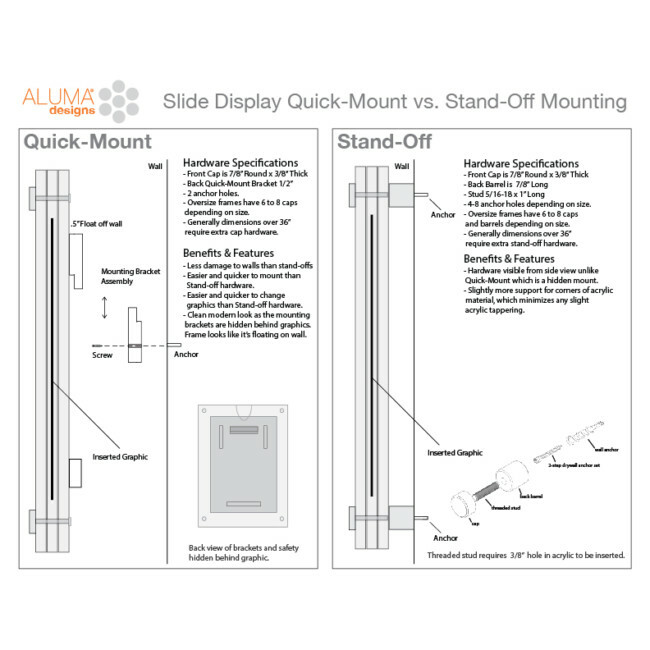 Futura SLIDE displays use 1/4” frame grade acrylic for both the front and back pieces of the display. The U-Channel layer is made with 1/4″ acrylic for the large displays and 1/8″ acrylic on the small displays. The Futura Slide also features 1/8″ brushed metal frame. What about the quality and durability? 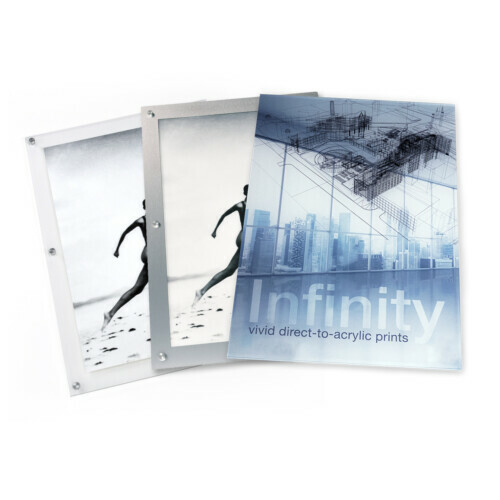 Example: Select (3) 8×10 Futura Slide Stand-Off frames and (7) 15″x18″ Futura Slide Quick-Mount frames and receive a 10% volume discount off your Futura Slide order. All discounts are automatically calculated in your shopping cart. Promotional codes may not be combined with volume discounts. *XL Frames and XL Orders will be shipped by ground freight.